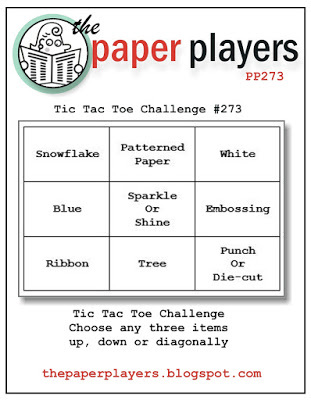 It's Monday and time for a new challenge at The Challenge! This week we have a wonderful inspiration photo for you to play along with! We can't wait to see what you create! 1. 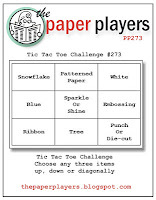 Use the challenge to create a card or paper project. I used Doddlebug Designs Sugarplum Collections DSP for my patterned papers. The Santa and gifts are from Avery Elle Stamps and dies "North Pole." I used a variety of Copic Markers to color the images. Wink of Stella and Marvy Snow Maker Pen were used for all the shine and texture. Guest Designer Bobby Hagen - of Bits and Pieces! 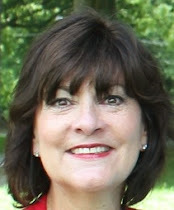 The Sensational Sandy is our hostess this week! She has a fun BINGO challenge for us to play along with! We can't wait to see all your creative projects! I used the top row-Snowflake, Patterned Paper and White and then I realized I used the first column on my card, too-Snowflake, Blue, Ribbon. (I count twine as ribbon:) I love the way this card turned out. Sometimes, you smile when you are finished! My base card is white card stock. The next layer is from the Echo Park 6 X 6 paper pack-Winter Wishes using the My Favorite Things-Blueprints 21 rectangle die. 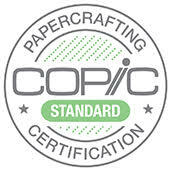 The next layer is from the same paper pack. My Favorite Things-Fishtale Stax dies were used to cut the two stitched banners with the same DSP. I stamped the "let it" with Reverse Confetti-Winter Words Stamp Set with Basic Gray ink. The word "snow" was cut using Reverse Confetti-Winter Words using white card stock. I cut five of them and I added glue and Dazzling Diamonds glitter on the top one. 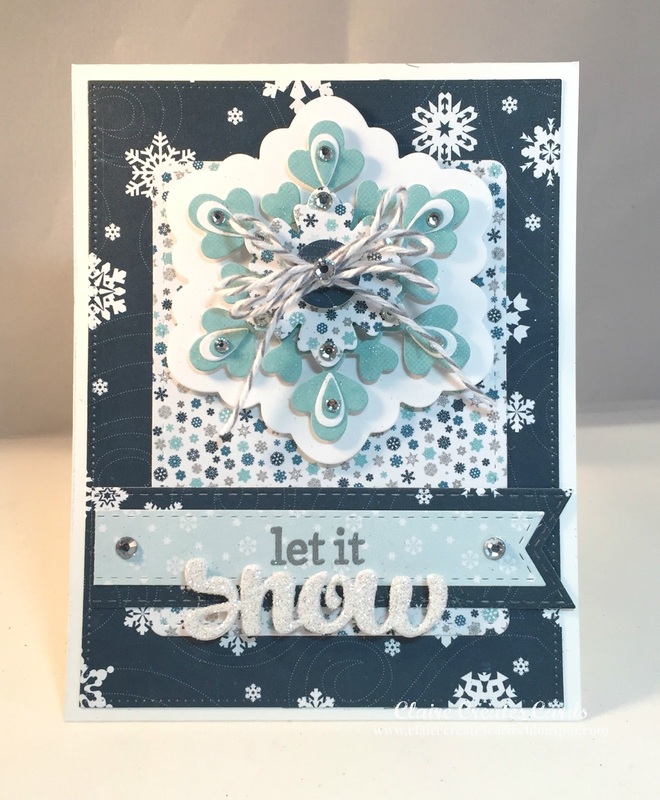 The snowflake is die cut using the Reverse Confetti-Layered Snowflakes Die. 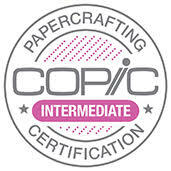 I used white card stock and papers from the Echo Park DSP paper pack to build the layers. Dimensionals were used to make the layers. Lots of rhinestones were added for fun! I added Gray and White Baker's Twine to make the bow. Please link your card to no more than three challenges, TOTAL. Entries linked to more than 3 challenges, including ours, will be deleted without notification! 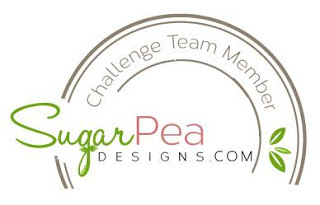 It's Monday and time for a new challenge at The Challenge! This week we have a gorgeous inspiration photo for you to use. We can't wait to see all of your beautiful projects! My base card is a white square. (5 X 5) The next layer is Garden Green (4 3/4 X 4 3/4) The top layer is red and white polka dots (found in my stash) cut with Simon Says Stamp Square Stitched dies. The green holly rectangle is cut using the Simon Says Stamp Stitched rectangle dies using Doddlebug Designs SugarPlum Paper Pack. The banners are created using the stitched rectangle fish tale banner dies by My Favorite Things. The sentiment is from a retired Stampin' UP! stamp set (Good Greetings). 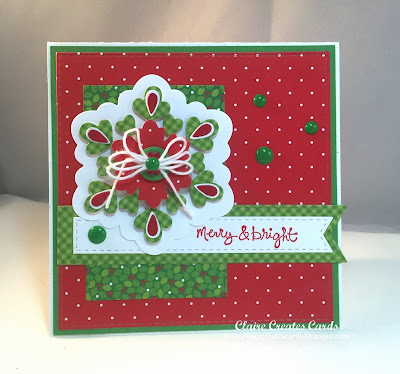 I stamped it with Versa Mark ink and heat embossed it with Zing Rouge embossing powder. I used the Reverse Confetti-Layered Snowflake Die to create the snowflake. 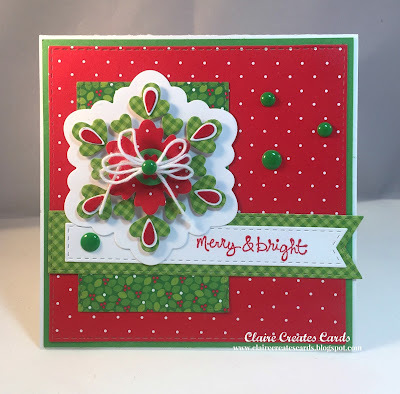 The base is white and the green is from the Doddlebug Sugarplum paper pack. Real Red and Garden Green are used in the layers. I created a white twine bow and added one of the enamel dots on top of the bow. More green enamel dots were added for fun. Guest Designer - Kim Lackenbach of Kim Creates!